In 2007, the one single audio component to capture my heart completely was undoubtedly the Craz Rack and Ohio XL+2 vibration control platforms so meticulously engineered by Silent Running Audio (SRA). Quite simply, these two products have changed my entire perspective on the subject of vibration control (complete review forthcoming.) The basic idea is simple: different audio devices must have tailor-made vibration control devices due to differences in weight distribution and composition of chassis materials. 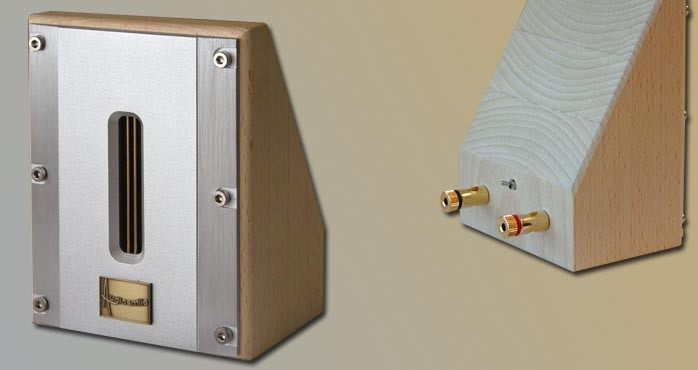 For example, a chassis made of wood will have very different resonance properties than one made from steel. As a result, a tailored-made specific solution must be applied. If one doesn't buy into this concept, ask yourself this: "Can I replace the suspension system of my Toyota limousine with another suspension system from, say, Mercedes or Porsche?" 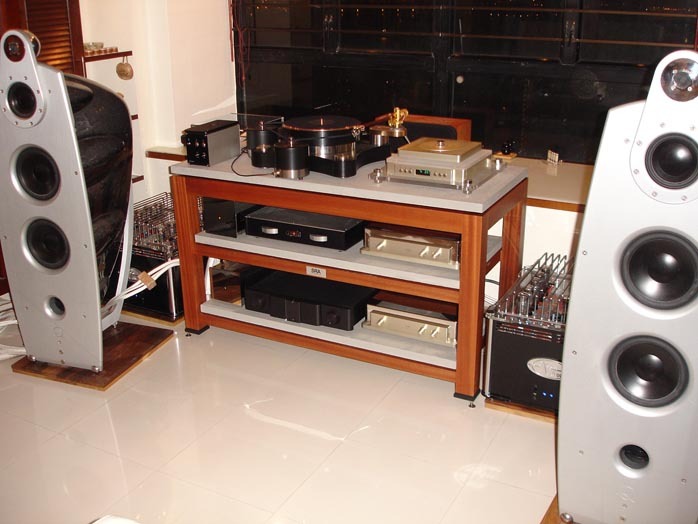 It is pretty common amongst audiophiles to rely on heavy wood or steel/aluminum platforms for their beloved components. In the past, this included me. Kevin at SRA is a serious scientist who worked for the US Navy in the field of resonance-control technology. I learned a lot from him through our many email correspondences. In particular, I know for sure now how weight/mass alone never presents a complete solution to tackling the propagation of vibrational energy. Can you not feel the ground shake long before the train arrives at the station? Iron tracks, concrete foundations, tons of soil  none of it is enough. Components atop the SRA Craz rack and the Ohio XL+2 platforms peel away layers of noise mist you didn't notice before. There is so much more ambience surrounding lower and mid-bass notes. The contour of bass lines becomes much cleaner than before without sacrificing weight and control. On piano recordings, the amount of information in-between each musical notes is presented with fluency and articulation at the same time. I am not referring to a complete blackening of the background noises. These equipment isolators simply have the ability to sort out the mechanically induced dirt from the music without robbing the latter of its life. Soundstage fanatics will be enormously rewarded by these groundbreaking mechanical control instruments as they can now see through the Z-axis in a continuous manner. This is not the type of broken-up soundstage usually characterized by the fixation of puppet-like musical objects within a specific area of air. Instead, the communications among musician amidst the acoustic characteristics of the recording venue become vividly obvious. The micro movements of the musicians alongside subtle ambience nuances are fully exposed. The sound of applause during intervals of live concerts is another major improvement. Even the rhythm of hands clapping is resolved to no longer sound like firecrackers. All of my audio comrades who previously did not believe in the magic of SRA now own at least one SRA Ohio XL+2 platform (Marvel's system above). I regard those devices as an absolute necessity for anyone serious about getting the most from their systems. The SRAs are not audio accessories but instrument-grade devices. The change between with and without Ohio XL+2 underneath is a night and day difference (I tried hard to avoid this trite phrase but in the end, I simply could not). Whenever I plan on changing a component now, I always think of changing the corresponding Ohio XL+2 platforms underneath. Just like the magic of Franck Tchang's Acoustic Resonators, once you know that resonances exist, you simply cannot leave them unattended. After almost a year of living with Silent Running Audio, I can now always easily detect the vibrational noises of the floor and component enclosures when systems lack vibration control instruments from SRA. 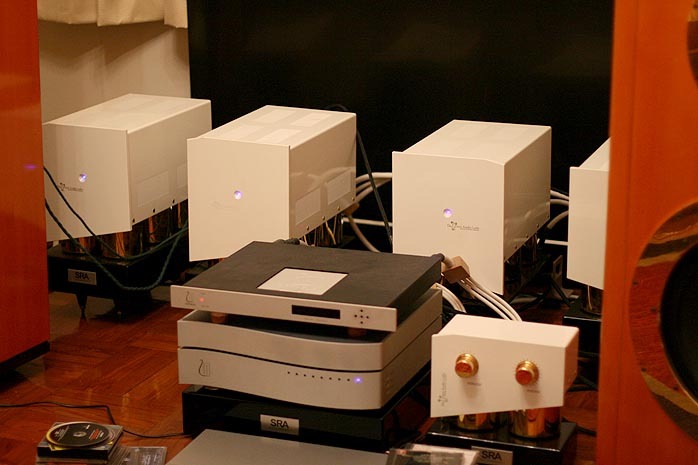 The Da Vinci Audio Labs Grandezza amplification system was another unique experience this year. It redefines my subjective understanding of musicality. It is neither of the Jadis type of romanticism nor Linn's genteel approach. The final replacement of the muRata super tweeters with the custom-tailored super tweeter by UK firm AudioSmile (review to be submitted soon), to match the HF frequency response characteristics both on and off axis with the Supravox widebander installed in the Da Vinci Intonation speaker, has brought me to an esoteric level of musical enjoyment. I cannot say it is the best out there but it has grown into a system that is truly unique in its interpretation of music despite the significant costs of acquiring the necessary components. Apart from the price of the Da Vinci system, there are the sheer size of its components coupled to the limited flexibility of hardware matching with other brands (Da Vinci voices top to bottom with their own components including the speakers). Hence I believe it more appropriate to select SRA's Ohio XL+2 and Craz rack as my personal Favorite Discoveries of 2007. In fact, the groundbreaking musical performance of the Da Vinci system would be severely undermined were it not served by Ohio XL+2 vibration control platforms underneath the armada of Grandezza amplification enclosures.